These panels are designed with solar cells composed of semiconductor materials. The main function of Solar panels is to convert solar energy into DC electrical energy generally of 12V, which is further used for the rest of the circuit. The number of cells required and their size depends on the rating of the load. The collection of solar cells can produce maximum electricity.But, the solar panel must place exactly at right angles to the sun rays. Water sources are available in the form of springs, drilled wells, rivers, ponds, etc. This solar system contains a submersible pump, a water tank, an irrigation pump, associated water pumps. 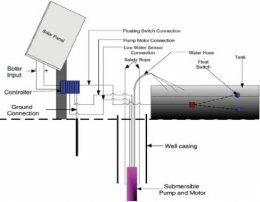 In the site trial, the submersible pump is kept in a stainless steel case, which is placed in a well pit at the junction of the open channel and the natural stream course. The pump controller pumps water to the water tank at a particular time period as set in the control unit. This system is designed with 450W of power, which is capable of pumping 2000 liters of water within 60 minutes. 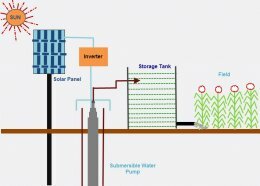 This power capacity takes into account the height difference between the water tank and the solar submersible pump. The photo voltaic cells depend on the size of the pump. A panel is esteemed in watts of power it can produce. This solar submersible pumping system should be operated with a PV array of capacity in the range of 200 to 500 watts peak, and measured under some standard test conditions. A plenty of modules in series & parallel could be used to get the necessary PV power array power o/p. The o/p power of the PV modules which are used in the PV array under standard test conditions should be a min of 74 watts peak. A solar charge controller is very important device in any solar-power system. It is used to maintain proper charging voltages of the batteries. 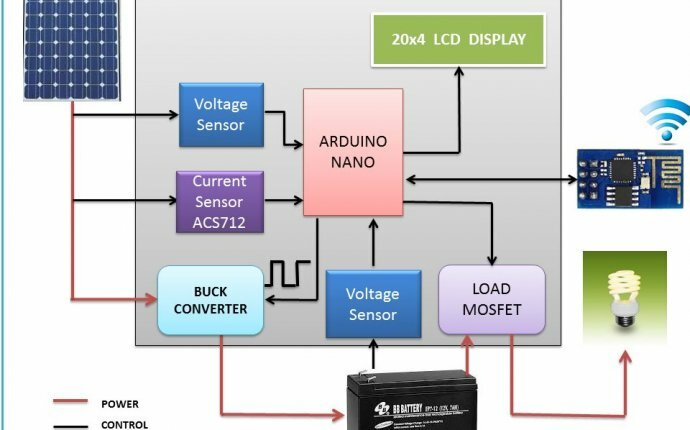 The charge controller controls current and voltage from the solar panel and charges the battery, and also stops the charging of the battery from over and undercharging conditions. The Battery is an electric device, that is used to store current which is produced from the solar panel and supplied to the corresponding loads. The number of batteries required depend on the load requirement. The main function of the inverter is that it converts the battery’s voltage to AC voltage in order to activate then loads. Therefore, it helps us to run many electronic devices, home appliances and computers. There are numerous types of inverters available in the market today.The characteristics of typical inverters include high switching frequency, high conversion frequency and less harmonic content, and so on.